Matt Wittman, 27, of Cambridge, had been looking to become more politically involved when a friend forwarded him an email about an event geared toward improving millennial engagement in government. Wittman attended the talk on Thursday and shared excitement for the focus on involving younger generations. 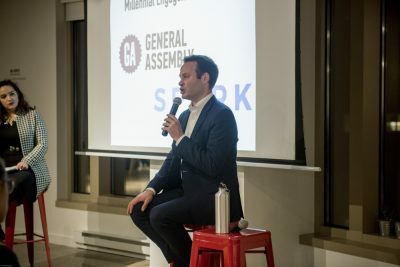 The talk was hosted by SPARK Boston, state Sen. Eric Lesser and General Assembly Boston, featuring a fireside style chat between Amy Mahler, director of SPARK Boston, and Lesser. Mahler supervises a council of 38 members between the ages of 20 and 34 who live throughout 20 different Boston neighborhoods. The discussion was hosted last Thursday and centered around the Millennial Engagement Initiative. Lesser and his colleagues established the initiative in 2016 after leading millennial outreach for the state Senate that included participating in roundtable discussions in towns across the Commonwealth. Lesser is one of the youngest state senators at age 33. During the discussion, he expressed concern about the millennial generation losing faith in government. As times have changed with technology and many other factors, Lesser said government has mostly remained static despite changes he has seen throughout his life since his birth in 1985. Lesser said he would not recommend structuring government on a system that allows radical changes, but that he believes outreach to younger generations should shift to accommodate the differences in attitude. Wittman said that while millennials are good at staying updated through technology, they can begin to overlook some important events from information overload. SPARK councilmember Rosa Herrero de Andres from Jamaica Plain said she feels passionate about politics, so she wanted to join the council to help engage those less active. From her experience, Herrero said she sees politicians receiving more feedback from people complaining and less from community members seeking to change legislation. Herrero said she believes millennials offer an important different perspective from older generations, so lack their lack of involvement is detrimental to all. 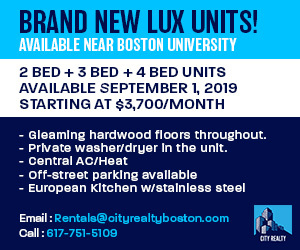 Shanice Wallace, a councilmember from Mattapan, was initially attracted to join the council because she didn’t feel there was a specific space for millennials elsewhere. Herrero said SPARK hosts events like this discussion to help promote relationships between city officials and private citizens. However, she said the council also encourages those who attend events to continue to reach out to politicians individually through emails, calls and other ways to become involved.